The Piast ensemble develops team work, fosters a high standard of citizenship in Canadians of Polish descent and promotes Polish dance, music, folklore and ethnography in the form of seminars and workshops. In its short existance Piast has already performed 17 times, some of which are performances at Heritage Day Celebration in Edmonton and the International Children's Festival in Iwonicz Zdroj, Poland. 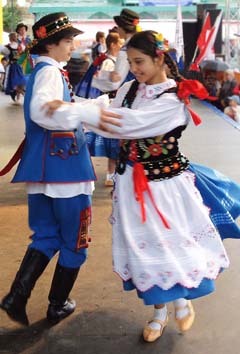 Piast's repertoire includes dances and songs from different regions of Poland such as Przeworsk, Pogorze, Sacz, Kaszuby, Lublin, Beskid Slaski, as well as the Polish national dances Polonez and Krakowiak. For registration information please contact us!